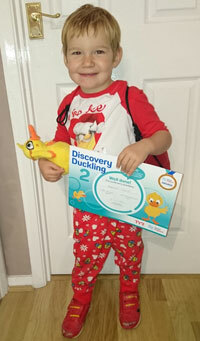 Catch up on our latest parent blog where Emily tells us about two-year old Seb’s emotional start to preschool swimming lessons and how the journey has been made easier with the introduction of Duck from the Swim England Starter Pack. Yes, I know, a really imaginative name. Well that’s what you get when you ask a two-year old to name a toy. He joins the family along with Giraffe, Penguin and Monkey. Now Duck could not have arrived at a better time. We have been battling for a couple of weeks with Seb starting preschool swimming lessons. Whilst all the other children skipped off away from their parents, Seb has been a little more emotional. I will never forget that first week, watching through the glass at my little boy hugging his woggle and sobbing his heart out. He looked so small, in such a big pool. I dreaded week two! To offer a little comfort, we sent Seb in with his best friend George the Giraffe. Off we went, around to the viewing area. When we got there we were greeted with Seb’s swimming teacher, Stacey, putting arm bands on both Seb and George. There was definitely a smile amongst those tears and I knew we were making head way. All week we talked about George going swimming. Well that was until Duck arrived! Seb’s little face lit up when he opened the parcel from Swim England. We talked about how Duck has armbands and therefore he must still need to learn to swim. We agreed that Seb should take Duck to his swimming lesson and show him how it is done. We even read the Discovery Duckling book to Duck. Seb did some dry land demonstrations and it was lovely to see him relate his swimming lessons to the book. One little Duck went swimming one day…. So off Duck, Seb and George went into the swimming pool. No tears this week, Seb had Duck to look after! On went Seb and George’s arm bands and they looked like the three amigos. I am not sure if Duck was actually meant for swimming but in he went. Chris (Seb’s other teacher) even used Duck to demonstrate some of the activities. He is now sat on a radiator, drying out ready for next week. Now we have a happy little swimmer, I am looking forward to filling Seb’s new award file with his past Discovery Duckling Awards and the future Ducking Awards I hope he will achieve.